This is the story behind my Guinness World Record™ for the Most baseballs held in a baseball glove. Ah yes, baseballs. We had seen each other before, I recalled, as I lay them out under a tree in the front garden of a community centre together with a large leather baseball glove. These were probably the same balls and glove I'd borrowed from the local supply company in the past. 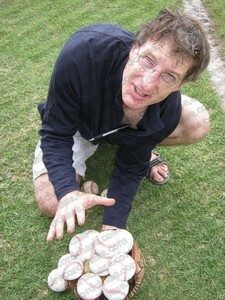 I liked baseballs by then, since I already had a world record for holding them. But that day, I was going to try and get myself an even better world record. As always, I had practised. But this time, I'd not done much of it. Why should I have? In the recent past I'd successfully done what I was about to repeat then. A world record adjudicator was with me that day. He was due to step out of the building any minute. This made for an easy world record attempt because I would not need to complete the admin I was so accustomed to. If I were successful, I'd be told right there. Now, let me tell you, that's worth performing for. I wanted to be as ready as I could be when this all-important man came walking toward me. Having read the rules – in fact, having remembered them too – I confidently went about shuffling all the balls together in a triangle that had been formed by spreading surface tree roots. I laid the heavy but floppy glove to one side and waited. The adjudicator soon came trotting down the steps with a stopwatch in hand. He knelt in front of me and indicated he was ready to begin the timing when I was. A small group of inquisitive children stood round. I spoke briefly about what I was going to do, then watched as they looked on eagerly. After a brief final check, the adjudicator clicked his stopwatch and the pressure was on. Baseball after baseball, I plucked them from the collection to my left and rested them in the glove, as fast as I could. Yes, I had to take care to position each in a way that was going to facilitate my goal: to fit in the most. So this became a compromise between speed and accuracy. Some balls wobbled as I placed them, but thankfully they didn't drop out of the gaping glove and roll away. I was extending my fingers and thumb away from each other as forcefully as I could, but the thick glove material was restricting how much of that I could do. The duration of this effort wasn't long; it seemed I'd hardly started when I was told to stop. Next, the adjudicator and I counted the balls together. I waited without saying a word. The adjudicator looked me in the eye and congratulated me on achieving another one of those world records I live for. Well, that was quick and easy. I was smiling broadly. Hastily, I packed away all the balls and the glove, because I had other things on my mind... more world records. Satisfied and feeling smug, I left the venue, knowing that as a person, I was one world record better than when I'd awoken that morning. Great!